1. ANGIOTENSINOGEN converts to angiotensin which is a potent vasoconstrictor and raises our blood pressure. 2. RESISTIN causes insulin resistance, a core defect in causing Diabetes Mellitus II. 3. TNF-Alpha causes inflammation of our coronary arteries & vascular system. 4. INTERLEUKIN-6 causes inflammation of our coronary arteries & vascular system. 5. PAI-1 Inhibitor interferes with our body’s ability to break up clots. For these hormones, Doctors need to address the problem of Obesity and Risk Reduction. 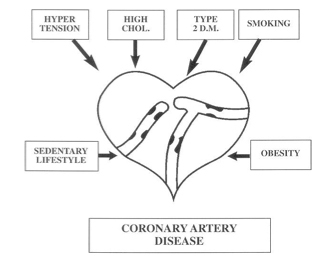 Diagram #1 shows the Reversible Coronary Artery Disease risk factors as seen by most Physicians and the insurance companies. Diagram #2 is how I visualize these risk factors. 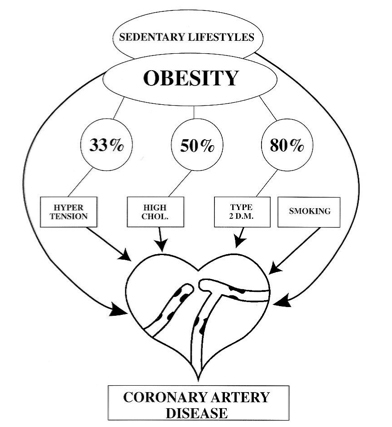 Please note how Sedentary Life Style is on the back of Obesity, and how these two factors influence High Blood Pressure, High Cholesterol and Diabetes-II. Therefore, the treatment of Sedentary Life Style and Obesity greatly influence our health by reducing these other risk factors. Doctors and insurance companies need to follow this pattern, as I do, to impact the health of America. Obesity has greatly increased in the last twenty years which shows our ignorance in the treatment of Obesity. A 10% drop in weight is where persons begin to see the illnesses associated with OBESITY begin to lessen in intensity. 1. Osteoarthritis of the knees, lumbo-sacral spine and hips. The time you take now to Learn “LEAN LIFE-STYLE LIVING” will help you add years to your life so you can see and play with your grandchildren and even great-grandchildren. You are sacrificing now to be a part of their lives in the future. For your sake and the sake of your loved ones, let's talk about what our weight loss program can do for your health!